There has been something besides work weighing heavily on me for the past few weeks. Kai Jettmar is 16 months old. About a month ago he had his first seizure, a massive one, which nearly killed him. Kai is the son of my ex-girlfriend Eva and she has been raising him without the benefit of Kai's father's assistance (other than some monetary assistance after the Child Support Services tracked him down in Seattle). I always felt sorry for Kai, as he would have to grow up without a father. I've looked forward to helping fill that void in some small way by being "Uncle Dav". He spent nearly two weeks at the Lucile Packard Children's Hospital at Stanford, which is about the best place on the planet for him to be. I am told they have one of the two most respected neurology departments in the world (the other one being Harvard). So he is getting the best care possible. Unfortunately his condition is one of the worst, and so far nothing has really worked. Kai has three types of seizures now. The major ones, like the first one which left him unconscious and not breathing (his mother had to give him mouth to mouth) and the tiny ones that are the most frequent but are only detectable by EEG, have been brought under control through a medicinal regimen. However the side effects of the medicine cause him to be so drowsy that he is rarely full cognizant. While in the hospital he was so out of it he was unable to eat or drink, so he had to be fed intravenously. The first two times I went to visit him he only woke up once, and that was to scream out in pain when the nurse had to insert a new IV. It nearly shattered me. I don�t know if I�ve ever felt so helpless. The third type of seizure is the one that has so far been untreatable. About 30 times a day Kai without warning passes out instantly and fully. It only lasts for a second, but the consequences are severe. When this seizure occurs he goes completely limp, like someone has pushed the reset button. Because of this someone must always be holding him, especially his head, unless he is lying down. There is a good chance he will have to wear a helmet his whole life. Eva tells me that children with conditions such as these often have dentures at the age of three because they knock all their teeth out. Last week he was allowed to go home after nearly two weeks in the hospital, hooked up to lots of wires and tubes and having tests run on him each day. I brought Eva�s old futon down to Mountain View so he could have a safe area to play in, where his collapses might not cause as much damage. It was the first time to I saw him awake in a couple of months because I had not been down to visit since they moved to Mountain View from San Francisco. It was so nice. I think he remembered me, he was smiling and pulling on my beard (it always fascinated him). About 5 minutes after I got there as I sat on the edge of the futon he crawled towards me. When he was only an inch away he suddenly collapsed face first. It was only an instant, probably less than a second, and when he came to he started crying and basically only cried and made unhappy gestures for the next 30 minutes until his grandmother rocked him to sleep. It was the first time I had actually witnessed a seizure, and it was truly heartbreaking. Eva says he has these 30 times a day. The most difficult thing is that because Kai is so young he really just doesn�t understand what�s going on, why all of a sudden life has become so awful. If only he could have been older when his condition made its appearance things would have been easier to deal with. 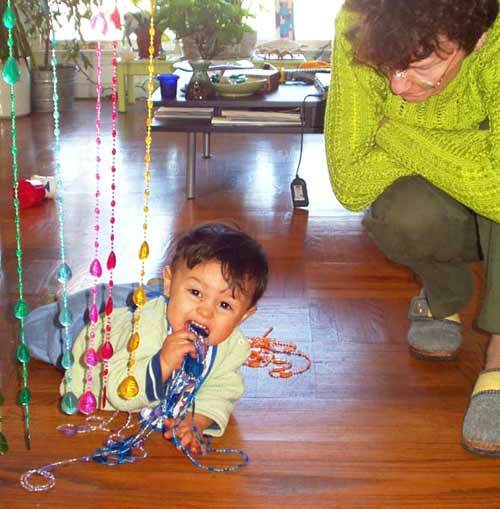 As it was, Kai�s mother and grandmother had begun to suspect that he was developmentally slow. 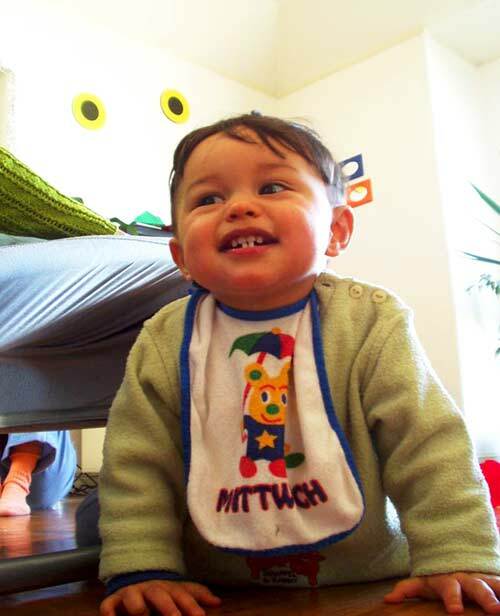 At 15 months he was neither walking nor talking at a normal level. I didn�t see much harm in that, but apparently it was the first sign that something was wrong with his brain. His development will be even more difficult with his brain being reset continuously and addled with the medicines necessary to control the more life threatening seizures. There is a concern that he may never learn to speak because he is at the age of the prime opportunity for the brain�s language skills development, although I hope that is not true. Eva says there are three standard medicinal regimens they try. The first has already failed, and he was on the second last week. The doctors do not have much hope that the second or third will work actually, because his case seems to be very severe. It might be beyond the capabilities of current medicine. In some forms of epilepsy they can do a procedure where they insert an electrode into the brain at the point where they suspect the problem lies. By sending electrical current they turn off that region of the brain. This has to be done while the patient is awake so they can gauge the effect of the loss of that portion of the brain. If the effect seems reasonable, they permanently shut down the region. Unfortunately this only works in the outer layers of the brain, and scans so far have been unable to pinpoint Kai�s problem area. They suspect it is too deep to be treated with this procedure. A more desperate surgery is one where they sever the two hemispheres of the brain. This surprisingly tends to not be as psychologically devastating as you would think. We don�t really know what it does because the workings of the brain are still so murky to modern science, but sometimes it makes life better for severe epileptic cases. The seizures don�t stop, but they may not cause unconsciousness, allowing the sufferer to sit down rather than collapse. I�d like to apologize to anyone who has actually read this far. This is probably both my longest and saddest post ever, but it�s something I�ve been dealing with for few weeks now and I guess I needed to get it off my chest. The whole affair has already brought tears to my eyes and heaviness to my heart, and it doesn't seem to be improving. I got a quick email this evening from Eva. She says Kai has been brought back to the hospital. Tomorrow I will try to go down and see what his current condition is. Dav, thank you for sharing your concern and your pain. The situation must be particularly hard on Eva and her family. How is she coping with the daily trauma? Taking care of Kai is basically a 24/7 job now, so Eva and her mom's lives have become difficult. I suppose they are holding up well given the circumstances, but I wouldn't wish this sort of grief on my worst enemy. To make things worse, Eva and her mom are Austrian. Eva is here on a student visa, finishing up her PhD at Stanford. Eva's mom's tourist visa runs out this week, she will have to go back to Austria for at least one week. Eva and Kai might go back with her, if not I plan on going down as often as I can to help her while her mother is gone. Dav, really sorry to hear that too. brought tears to my eyes too and all I can do is just hope that he ll get a little better soon. Hope you manage smth with the walker. good luck. send my support to Eva and her mum. sad. there must be something that can be done to help this little guy? it is terrible that we know so little about the chemistry of the mind. best wishes; my heart goes out to kai. There's not much hope for a true recovery, now we're just hoping they can find a way to control the seizures and/or prevent him from being so mentally deficient as to be completely reliant on others to survive. Yes, it is a shame that neurological disorders are so little understood, but I doubt we'll make the same sort of progress in that area that we've grown accustomed to in technology fields. At least not any time soon enough to help Kai's life probably. My daughter was diagnosed with Lennox-Gastaut syndrome years ago. She is now 27 and currently is having an increase in seizures. But she's already improving, and I expect to work through this and bring them back down to a manageable level. I have learned to be as tenacious as a bulldog. I never EVER give up or give in. I guess I never will because when it seems like I hit a brick wall, I always manage to think of that next thing to do. I have only a few basic rules that I try to remember in my approach to caring for my daughter, and one of them is that I do whatever it takes to keep her safe. I was struck by the sadness of your post and feel compelled to share a bit of what I've gone through. It IS sad. There's no denying that. It's sort of like you are losing something that you never had -- an ideal image of a child you could drench in love and learning and all of the best that life, art and nature has to offer. Instead, all the rules of communication, sharing, learing and love-giving have changed. And there is absolutely no handbook to guide you through the experience. So... you write your own handbook. You learn lessons every day, and sometimes it takes years of brutally hard work and times before you realize that you have learned some of the most profound lessons possible... lessons that only a tiny handful of individuals are priveledged to learn. But the lessons come from hundreds of sleep-deprived nights and nerves on edge. And then one day you realize that your desire for him to live up to that former ideal has been replaced by something else. Acceptance of the situation will have grown on you over time like a fine patina. And when it's there, it stays and glows and protects you. My daughter is a constant source of delight, terror, aggravation, admiration, sorrow, laughter, amazement, comfort, exasperation, inspriation and much more. She weaves our family together and makes us laugh more than anything in the world. We have more funny stories than you could imagine. Her capacity for love and acceptance is unlimited and she showers us with it unabashedly. She is a study in contrasts, yet is as predictable as the moon. She ignores us when it pleases her and wants attention as soon as it's inconvenient. If I could go back and change whatever it was that turned my daughter into the person she is today, would I? I have to say no. I would not. Her impact on our family and so many others has resulted in such ripple effects of good that I would be fearful to take that away from the world. And, I would definitely laugh less. Take heart. Your child is love personified and he will give you wonderful opportunities to be a person who loves unconditionally. If you follow another rule of mine: laugh and live in the moment, he will take you on a journey you cannot imagine.